One of the most-often asked questions on the BIRRR facebook page is ‘How can I save data? It seems to be vanishing without me doing anything!” While sending photos and uploading big documents are often unavoidable as we conduct business via the internet and can eat into our data limits, there is actually quite a lot we can do to curtail some of the often-unseen big data users chewing through our very limited monthly gigabytes. Operating system updates for Apple iOS are AUTOMATIC if you are connected via WiFi or cable. If the device is Cellular only, it is NOT automatic, and can be scheduled. 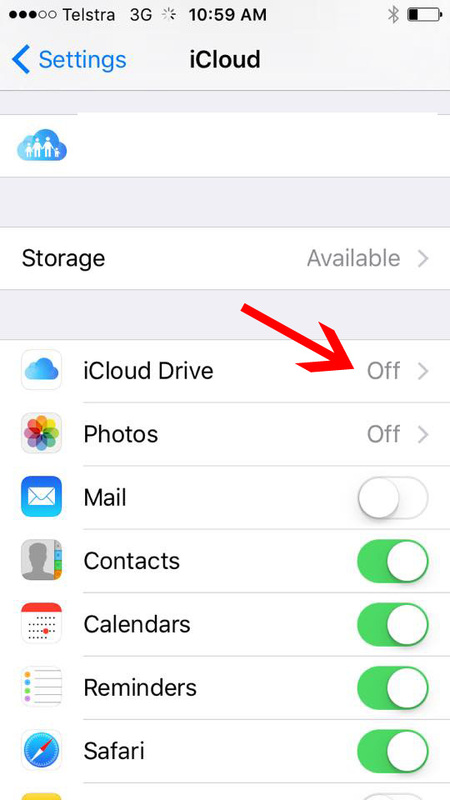 Disable a feature called Wi-Fi Assist which is enabled in the default settings of iOS 9. Our iDevices can chew through ENORMOUS amounts, through updates and syncing. Go through the following checks to ensure your iDevice is NOT automatically chewing through precious data. The first step is to find the SETTINGS on your device. 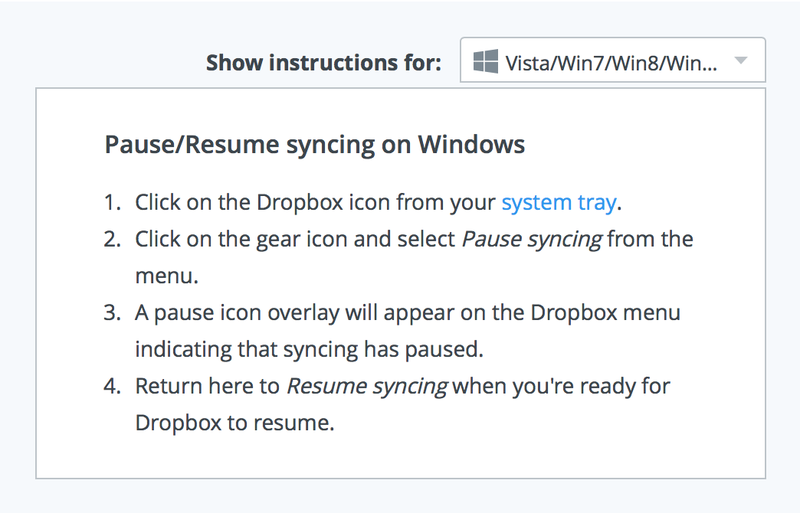 This is a good spot to uncheck any other ‘auto-updates’ you might not need synced. 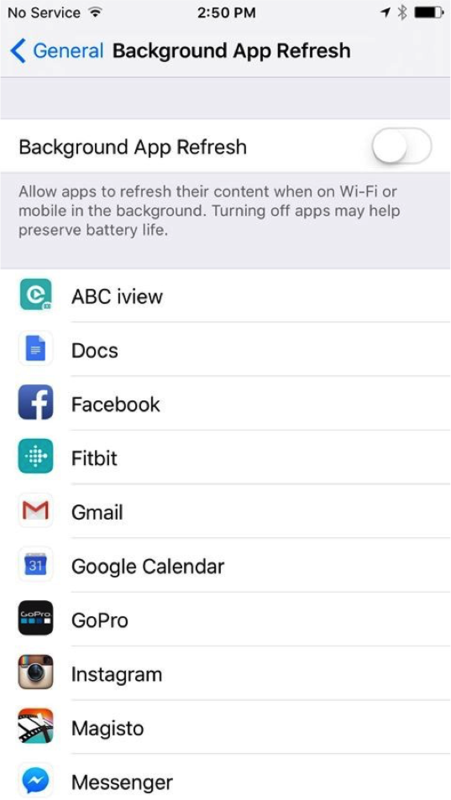 Check that apps that aren’t needed all the time are not updating and turn off wi-fi assist. Wi-Fi assist automatically defaults to using your mobile data when Wi-Fi signal is poor. This means your mobile data could be used without you realising, causing your mobile service to exceed your monthly quota and accrue excess data fees. 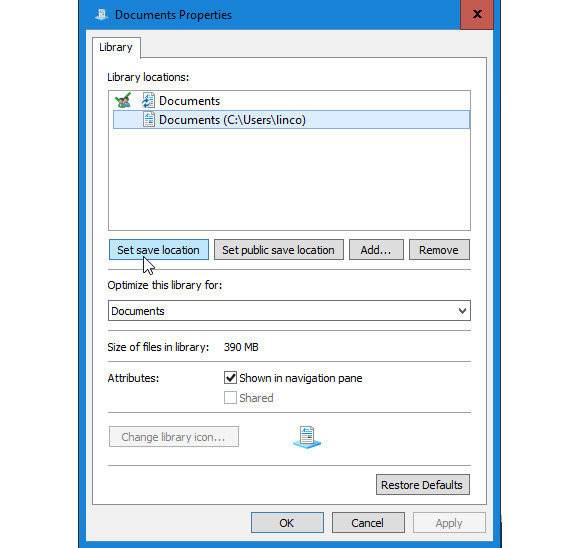 Go though your apps and UNCHECK those you don’t need constantly accessing data. 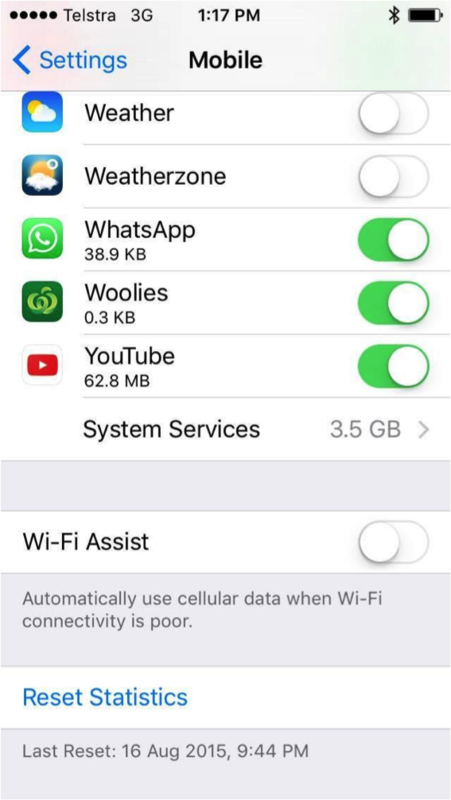 NB: Wi-Fi assist is a feature that is enabled by default in iOS 9. If your i-Device is running an earlier version of iOS, your device will not have this feature. WARNING: Your i-Device will automatically download iOS updates (when a new one is available) while it is charging, connected to the internet (thru WiFi) and there’s sufficient free space on the device. It will then prompt you to install, turning off updates will NOT prevent the auto download of iOS updates. Turning your device to airplane mode whilst charging OR having your device ONLY on cellular may prevent this. Scroll down this page until you see the AUTOMATIC DOWNLOADS heading. All new content that you buy after you turn on Automatic Downloads automatically downloads to all of your devices. 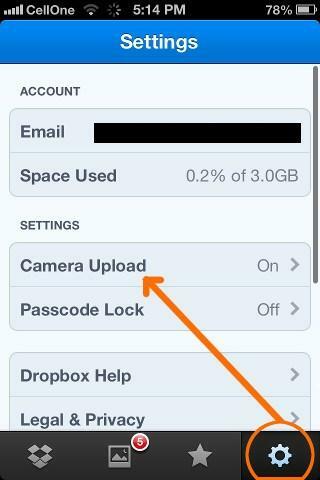 When you turn on Automatic Downloads, your device associates with your Apple ID.If you use Family Sharing and turn on Automatic Downloads, content bought by other members of your family won’t automatically download to your devices. Only content that you purchase with your Apple ID downloads automatically.Here, you’ll see four options. 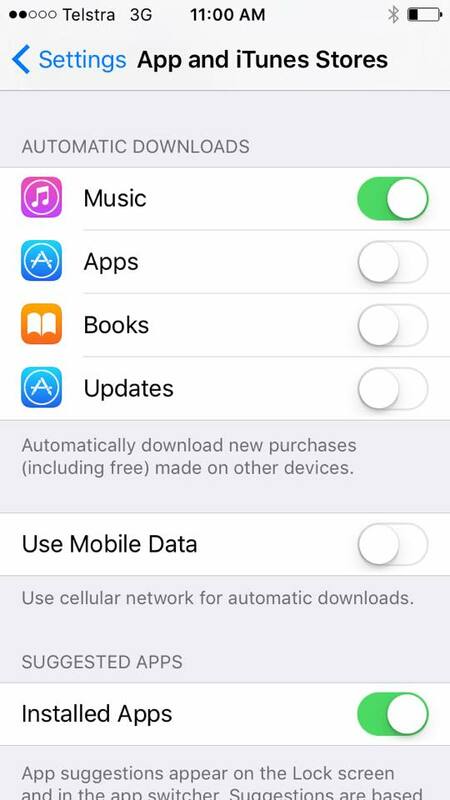 Turn off Updates and other automatic downloads such as Music, Apps and Books. Music – When turned on, any purchased iTunes music will download automatically. 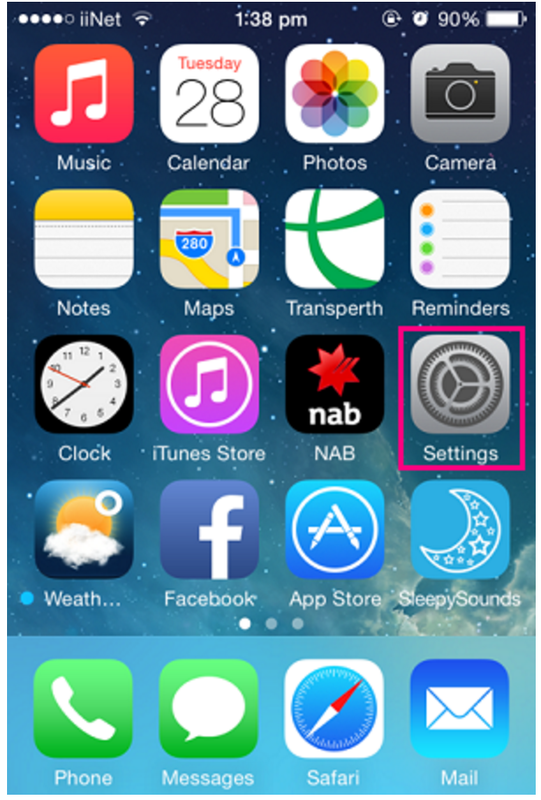 Apps – When turned on, any purchased apps will download automatically. Books – When turned on, any purchased Books will download automatically. Updates – When turned on, updates for any apps on your device will download as soon as they become available. See expert tip at the bottom of this article to adjust settings in your router (at OWN risk), this is the only way to prevent automatic iOS updates. If your iDevice has an Internet connection and you turn on Push Notifications, your content automatically downloads to your device. On devices that don’t support Push Notifications, your content automatically appears in your iTunes download queue. You can manually download the content in iTunes. 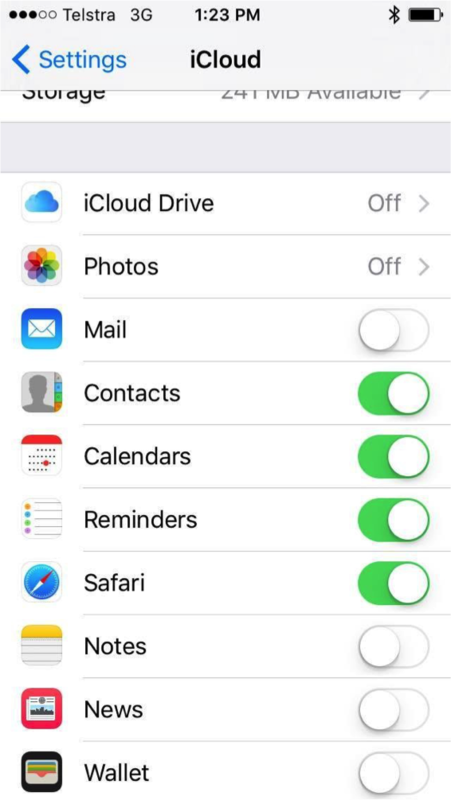 Turn off any apps that you don’t require push notifications for. All of the above tips will often need to be re-applied after completing an update. 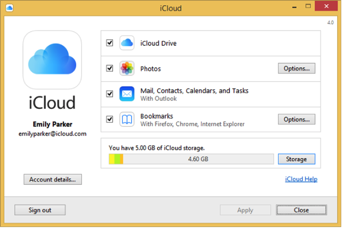 An easy and easy to forget tip is also to shut down all your apps and browser windows when you have finished with them. Swipe apps (and browser windows) closed. Expert Tip: Your iDevices will automatically download iOS (when new one is available) while it is charging, connected to the internet (thru WiFi) and there’s sufficient free space on the device. To disable automatic download, you will have to put a block on your wireless router to prevent your Apple iOS devices from contacting Apple update servers. Add mesu.apple.com to your router in access control. Tips if you have multiple iDevices: You can use a computer with iTunes to download IOS Updates once, and then manually install the update onto multiple devices. Instructions for doing this are available by clicking here. Another option, if you have a Mac computer, you can install the macOS Server app from the mac App Store, which costs $19.99. This has a feature called “Caching” which, when turned on, will intercept any downloads from the mac and iDevice app stores, and keep a copy. 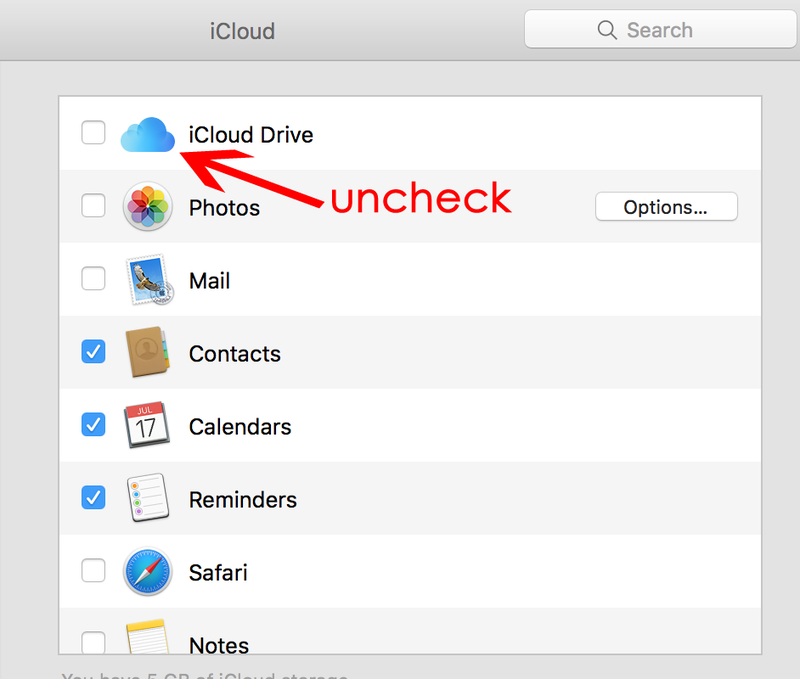 Next time a device requests the same file, it will download it from the mac instead of from the internet, saving your data. There is no need to tell your iDevices to fetch the updates from your mac, it just happens automatically This works with every device on your network. I have used this in a school with lots of iPads, and it was saving 100+GB per week at one point. Some more info is available here. 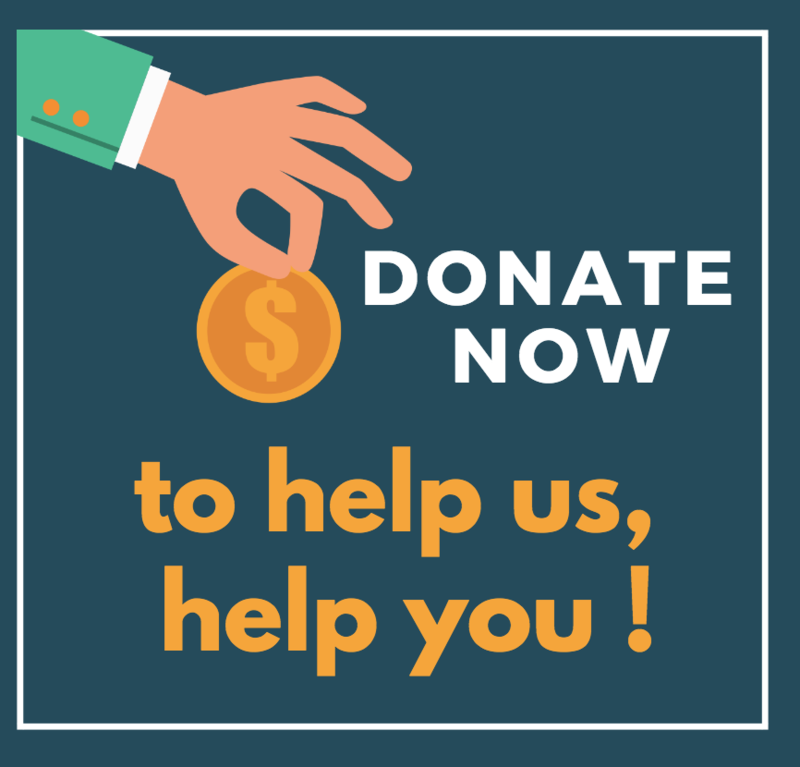 * Please note, while all care has been taken in compiling BIRRR documents, we recommend that you check with your service provider regarding your own connection issues and best plans available. 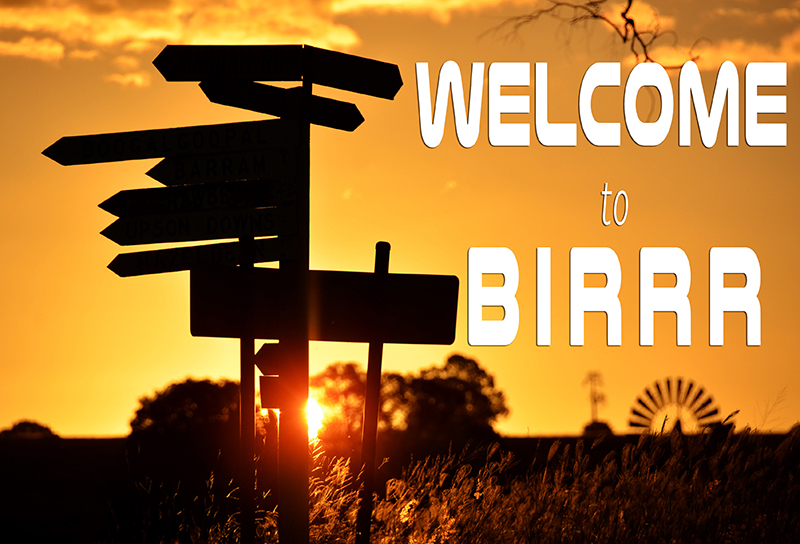 Information compiled for BIRRR by Julie Stott, Amanda Salisbury, Kye Rosendale, John Kitchener & Kristy Sparrow. BIRRR updates articles as time permits and when new information is available. Mac has a handful of features that rely on a constant internet connection, these include the update feature. OS X El Capitan, (10.11) the latest version of the Mac operating system is approximately a 6GB download. 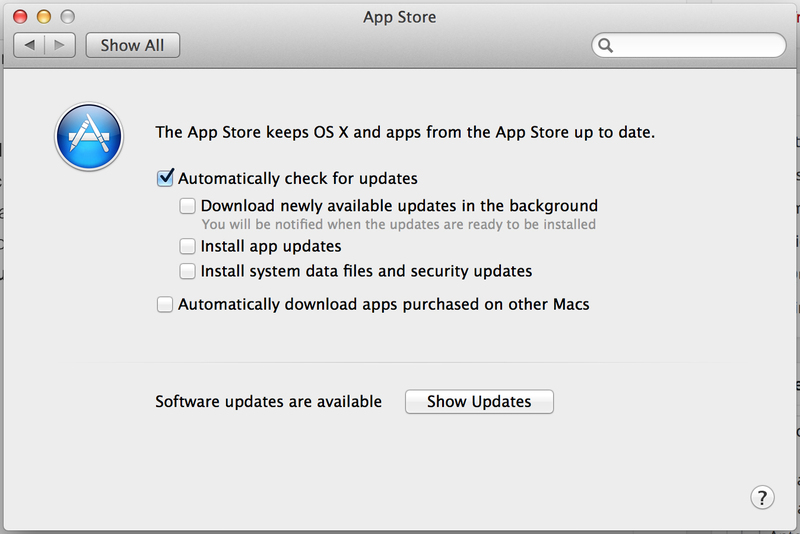 Operating system software and all apps in the Mac App Store will automatically download and update themselves. However if you have metered internet or are living in a data drought you’ll probably want to stop these updates from downloading in the background. 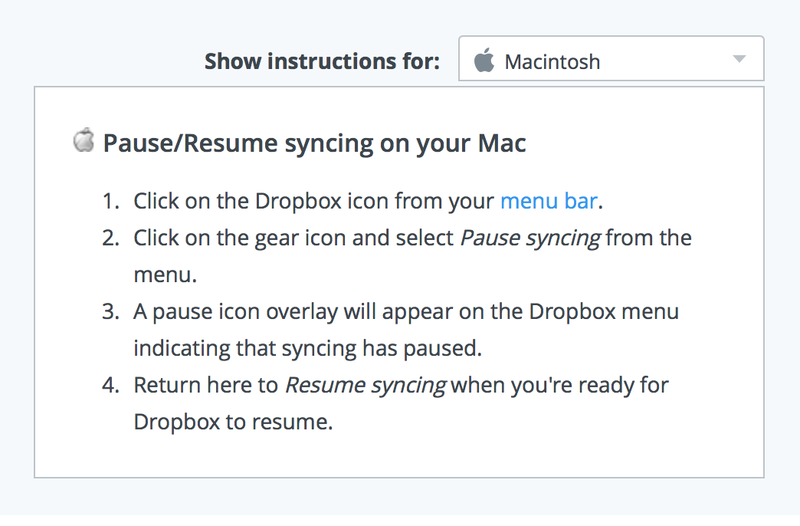 Automatic app updates are controlled by the Mac App Store. 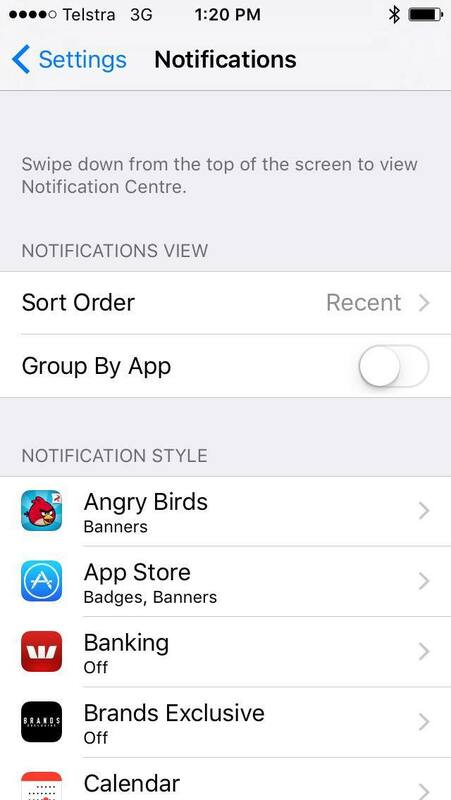 To change the App Store’s settings, go to System Preferences > App Store. You can still enable checking for updates, by ticking the AUTOMATICALLY CHECK FOR UPDATES BOX, and leaving the other boxes blank. This enables you to update when you have access to the appropriate data needed and allows the system to alert you to new updates available but does not download them without your permission. NOTE: Install system data files and security updates is recommended to be checked. When you are ready to install the updates go to System Preferences > App Store>Show Updates. You can then decide on which updates are the most important and click on UPDATE or UPDATE ALL (if you have the required data available). Important: If you’re going to use this automatic system update option, be sure that Time Machine backups of the Mac are allowed to be made on a regular schedule. Time Machine will do this automatically as long as it’s setup and the backup drive is available. If you do not make regular backups of your Mac, it is not recommended to use an automated system update installation feature. How you handle Apple IOS updates is going to depend on which update it is. To install onto a memory stick or external hard drive follow the instructions below. You might be able to do this when you have access to free wifi or a friend / relative who has a larger data plan than yourself. Please note, while all care has been taken in compiling BIRRR documents, we recommend that you check with your system operator before implementing any changes. Operating software can also be downloaded at any Apple Store, there may be a charge for this. Tips shared by BIRRR taken from Apple Chat help, October 2015. While all care is taken compiling these fact sheets, we advise you check with Apple Support if you have issues or concerns. Footnote: All information compiled by Amanda Salisbury & Kristy Sparrow for BIRRR and is current as at 18th October 2015.